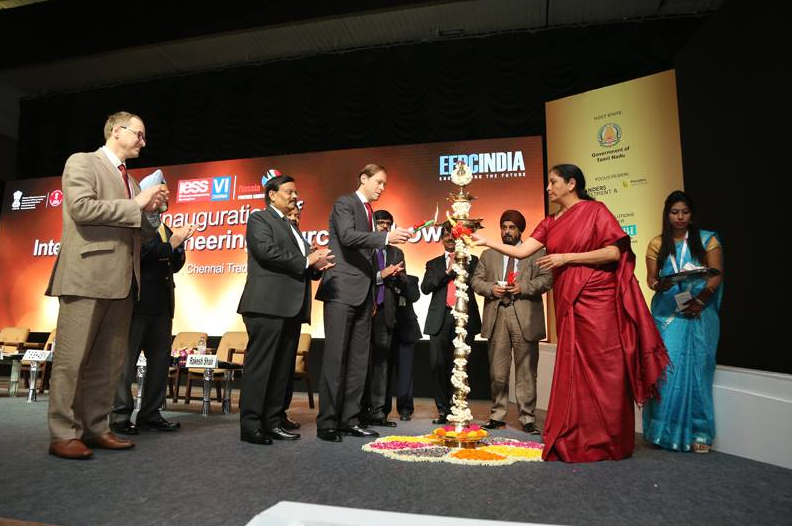 At the 6th International Engineering Sourcing Show in Chennai Indian and Russian ministers called on regional small and medium-scale businesses to help take bilateral cooperation to the next level. To reach their $30 billion bilateral trade target Moscow and New Delhi should promote cooperation between small and medium-scale enterprises (SMEs) in Russian regions and Indian states, Russia's Trade Minister Denis Manturov and India's Minister of State for Commerce Nirmala Sitharaman said on Mar. 16 at the 6th International Engineering Sourcing Show (IESS) in Chennai. Addressing the opening ceremony of the trade show, where Russia is the partner country this year, the ministers exchanged opinions on the future of Indo-Russian bilateral cooperation and spoke of the steps the governments are taking to boost trade. Around 40 companies from Russian regions are exhibiting their technologies and innovations at the show that is being organized by India’s Engineering Export Promotion Council (EEPC). Speaking at the India-Russia Business Forum organized on the sidelines of the trade show, Manturov listed some of the latest achievements on the bilateral trade front, not only in the energy and defence sectors, but in those areas where technology, innovations and engineering talent play a key role. He added that Russia and India have successfully developed a new approach to organizing city infrastructure, based on the latest IT innovations. Russia's AFK Sistema is currently in talks with several Indian states, including Gujarat, Telangana and Karnataka for implementing the Smart City concept. Russia's NIS Glonass and the Delhi Metro Rail Corporation are working on the ‘Safe Bus’ project aimed at improving the quality of surface public transportation services by providing the passengers with up-to-date information and ensuring their safety and comfort. The pilot bus is already on Indian roads, Manturov said. “The government sector will continue to dominate trade relations (between Russia and India), but the governments have an understanding of the importance of regional cooperation, and that between small and medium enterprises of the two countries,” the Russian minister said, adding that developing modern transport infrastructure is one of the most promising sectors where regional governments and businesses could work together. The fact that the IESS show is taking place in Chennai this year, and not in Mumbai, as per tradition, or the national capital, speaks of the Indian government's intention to promote region-to-region cooperation, Sitharaman noted at the gathering. The Indian minister spoke of the encouraging outcomes of on-going discussions on the international North-South Transport Corridor, the proposed free trade agreement between India and the Eurasian Economic Union (EAEU) and the bilateral investment agreement between India and Russia. She said these initiatives would help the two countries increase trade and investments as they address some of the fundamental problems such as logistical issues, trade barriers and the lack of financing for trade deals and joint projects. When asked about the practical realization of many memorandums of understanding signed between the countries in past few years, Manturov and Sitharaman said the latest deals in energy sector, the deal for manufacturing Ka-226 helicopters in India and the creation of a $1 billion Russia-India investment fund were some of the examples of the countries' commitment to increasing trade and investments. According to Shiv Khemka, vice chairman of Sun Group, Russia and India both have a huge potential in the form of human resources, hence the focus on engineering as an area of cooperation is a great idea. Among businesses represented at this year's IESS show are manufacturers and suppliers of components and parts, engineering companies and institutes. Russia is also being represented by several regional industrial parks and special economic zones, universities and innovations centres and manufacturing companies from Moscow, Yaroslavl, St Petersburg, Krasnoyarsk, Sverdlovsk, Yekaterinburg, Nizhny Novgorod and other Russian regions.